Sarah Margolis and her mother. The South Sectional is an MIAA championship bracket in which the top swimmers of the South Shore compete against each other. Rockland High School senior Sarah Margolis has qualified. To be eligible to make sectionals, a swimmer has to get under a certain time for their event. After sectionals is another faster, cut-off time for the MIAA D3 State Championship. A lot of top swimmers from Eastern Massachusetts make sectionals. Our section of the state actually has the most qualifiers each year. The cuts are based on the top 20 swimmers from the previous year in an effort to keep the meets as short as possible, so making sectionals is a big deal to any swimmer. This is not Margolis’ first time making sectionals. As a freshman she earned a spot due to her time in the 200 individual medley (IM). This year, as a senior, Margolis qualified due to her time in the 200 IM and for her time in the 100 breaststroke. 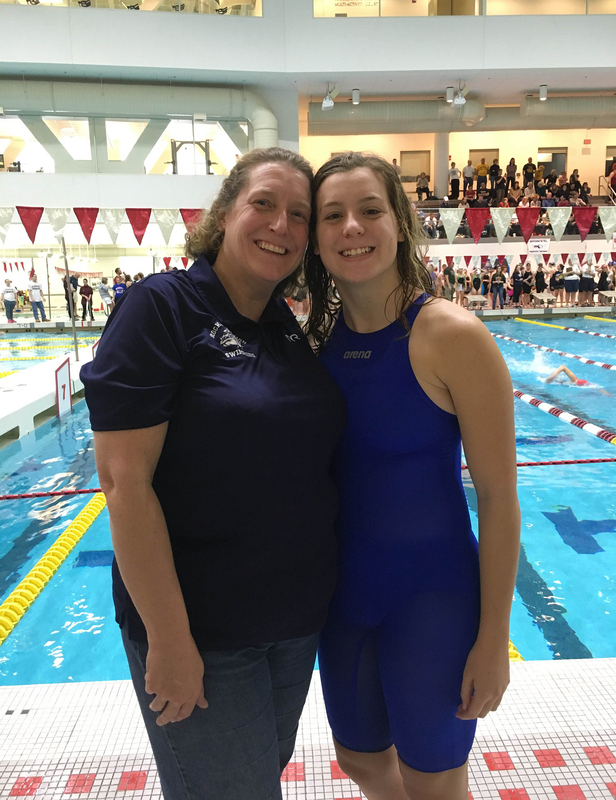 Julie Margolis has been coaching her daughter on and off for fourteen years. When Sarah was four, Julie was teaching swimming lessons and lifeguarding at the YMCA. Julie would take Sarah with her, and her boss allowed Sarah to stay in the aquatics office where she would play games and color with the staff on break. Last weekend Sarah drove to the University of New England in Maine with her friends to meet with the UNE coach. Julie thinks it’s neat to see that colleges want her for her excellent academic potential as well as her swimming talent. MIAA Central/South Sectionals for Girls were held at MIT on Saturday, Feb. 13 with an 8:45 a.m. start.